Home > Cambria > Cambria Countertops vs Granite: What’s Best for YOUR Home? If you are in the planning stages of a kitchen remodel, you know that one of the biggest decisions you have is what type of countertop to install. Very little in your kitchen will make so big of an impression or add as much value to your home as an exceptional countertop. The most popular and highest quality countertops on the market today are Cambria and Granite. Both offer the look of natural stone and have benefits for your home. Here at The Cabinet Store we have put our trust in Cambria products and believe you will fall in love with them too, but today we’re going to compare Cambria vs Granite to help you make this important decision for yourself. What are Cambria and Granite countertops? Cambria, made locally in MN and across the United States, is composed of 93% pure white quartz (an extremely hard mineral) and just 7% resin and pigment. Cambria is about twice the strength of Granite. Granite is made up of anywhere from 40% to 60% quartz, along with other softer minerals and impurities. This combination provides the wide display of colors you associate with Granite, however it also means that Granite varies widely in hardness, porosity, chemical resistance, and strength. What type of maintenance do these countertops need? Cambria countertops are maintenance free. They need cleaning only with soap and water. Not only are Cambria’s nonporous and nonabsorbent surfaces stain resistant, but they are certified by the NSF International as food-safe. Granite is porous and has a more delicate surface that can be susceptible to acidic foods, fruit juices and cleaners that contain vinegar, lemon juice or ammonia. There is also the potential for bacteria growth on Granite since it is a porous material. Because of this you need to seal Granite regularly, whereas Cambria countertops never need to be sealed. What range of colors do both products offer? Both products provide a similar high-end look for your home and come in a range of light and dark colors, though Cambria colors feature a more consistent tonal pattern. Cambria currently offers 165+ different color options, all fairly consistent color-wise from one slab to the other. How does Cambria vs Granite compare cost-wise? Although Cambria can run a bit more expensive than lower grade Granite, the more desirable premium Granite is consistently more expensive than Cambria, often making Cambria the more affordable choice. Cambria USA only allows their product to be measured and installed by individuals that have been certified via their Cambria University. 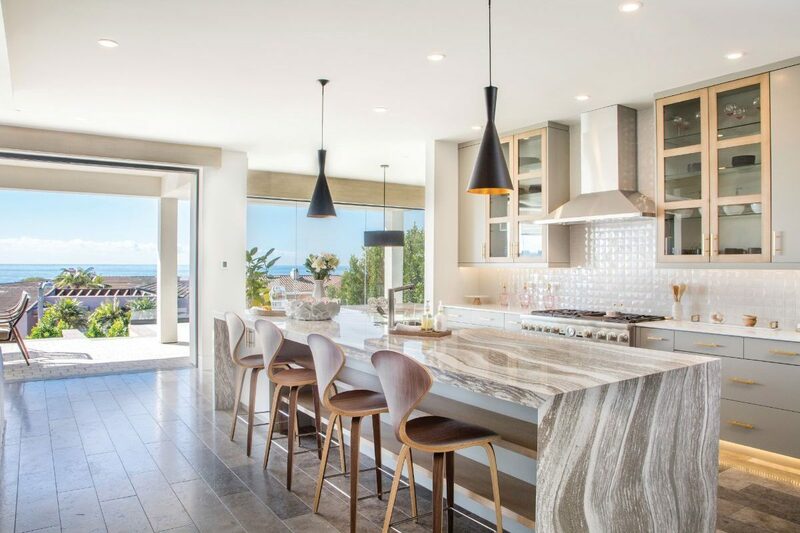 Countertop sections of Cambria are installed with European seams, giving it a seamless look, whereas Granite is only installed with straight seams that are usually highly visible. Though also beautiful once installed correctly, there is no quality control for installing Granite, meaning the incorrect installation of Granite countertops can potentially lead to expensive problems. Are Cambria and Granite eco-friendly materials? Cambria makers take their environmental impact seriously. Cambria quartz is mined so that 70% of the material removed is used in the finished product, whereas Granite mining results in only about 35% of the material becoming part of the finished product, impacting more of the natural environment. Cambria is also committed to recycling 100% of the water used in processing. Overall Cambria has a lower carbon footprint when compared to Granite. What kind of warranty do Cambria and Granite offer? We know that Cambria offers a lifetime warranty on their products. And the good news; they are now making the lifetime warranty transferable from one homeowner to the next! Just another reason we love Cambria! Since we don’t sell granite, we do not know the exact warranty that is offered. If you are interested in purchasing granite, I’d check with your local dealer. We know you’ll love Cambria countertops as much as we do, especially when you visit our incredible Apple Valley, MN showroom and see them for yourself! The colors are brilliant and the durability cannot be beaten. Visit The Cabinet Store soon and we’ll be happy to talk about your kitchen countertop replacement and kitchen remodel plans!